Surely there can't be many theatre or filmgoers who haven't already seen Mamma Mia! in one form or another, for having made its successful stage debut at London's Prince Edward Theatre back in April 1999, it has gone on to become a worldwide phenomenon. Mamma Mia! really is the ultimate jukebox-style musical and, while this latest touring production opened in Milton Keynes on Tuesday night to rapturous applause, that adulation will surely be repeated at each and every show right up until it closes at the new city's theatre on 20 May… that's judging on last night's performance. With a soundtrack penned by Abba's Benny Andersson and Björn Ulvaeus being woven into a rather fanciful and somewhat bonkers storyline by playwright Catherine Johnson, the Mamma Mia! musical was actually the brainchild of theatre producer Judy Craymer after she met the two Swedish superstars when they were working with Tim Rice on his masterpiece, Chess. Set on a sun-baked Greek island, it's the story of 20-year-old Sophie Sheridan (played by Lucy May Barker) and the search for her real father ahead of her wedding to fiancé Sky (Phillip Ryan). But as her mother Donna (Helen Hobson) had flings with three likely candidates in a carefree period spanning just 15 days some 21 years earlier, even she's not sure which of the dashing trio is her daughter's true father! However as Sophie is keen that her dad walks her down the aisle, she discovers the three names after reading one of her mum's old diaries and, unbeknown to mum Donna, she secretly invites them all to come to her wedding… and that when the fun really starts! All the best-known Abba songs – including Thank You For The Music, Voulez-Vous, Dancing Queen, S.O.S., Money, Money Money and, of course, Mamma Mia! – are sung at the appropriate time (and on the right occasion) while those familiar with the show (and film) will know the rest. I saw the original show in London's West End shortly after it opened and then again while visiting friends in Germany several years later. On that occasion all the dialogue and even the songs had been translated into German, yet amazingly, it didn't detract from the enjoyment and energy of this fun stage production. In fact my wife and I both sang in our best English at the top of our voices during the finale… as did our two German hosts! Shortly after that the Mamma Mia! film was released starring Meryl Streep, Pierce Brosnan, Julia Walters and Colin Firth with Amanda Seyfried – who played Cosette in the Les Miserables film – in the role of Sophie, and that added a yet new dimension to what is a true blockbuster show. In fact I know we've got the DVD somewhere and I've seen that at least half a dozen times! It really is a show full of energy and enthusiasm. It's tacky, quirky, sometimes emotional and romantic while being foot-tappingly brilliant. Those 1970s and 1980s numbers will live forever, especially among those of us old enough to remember watching the 1974 Eurovision Song Contest and enjoying Abba's superb winner, Waterloo! I loved Helen Hobson's portrayal as mum Donna. Her excellent timing and tuneful voice, while not quite in Abba's Agnetha Fältskog or Anni-Frid Lyngstad range, still allowed her to recreate some of those memorable classics even though the orchestra sometimes tried to overpower her. Helping get Sophie ready for her wedding, she was superb in singing the memorable and charming 'Slipping Through My Fingers', see also received rapturous applause for her brilliant rendition of 'One Of Us' and 'The Winner Takes It All'. 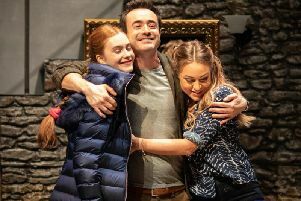 Meanwhile her two comical sidekicks – Rosie and Tanya – had the audience in raptures as they added so much to the humour of this superb touring production. Gillian Hardie (Rosie) had a tinge of a Liverpudlian accent while bringing shades of Julie Walters' film character to the role, her 'Take A Chance On Me' number bringing the house down. Meanwhile Emma Clifford (Tanya) was slightly straighter but just as funny – 'Does Your Mother Know' was great! – and together with Donna, the trio giggle and sing their hearts out. And then there's those likely fathers, Sam Carmichael (played by Jon Boydon), Bill Austin – I'm sure his film surname was Anderson! – is taken by Christopher Hollins while Harry Bright's actor is Jamie Hogarth, all three being far more melodic than the Mamma Mia! film trio of the aforementioned Brosnan, Firth and Swedish actor Stellan Skarsgård! Also full marks to the lovely Lucy May Barker who makes the role of Sophie her very own with some cracking vocals, her 'I Have A Dream' number both opening and closing the show. Full marks also to gymnast Louis Stockil as Sky's sidekick Pepper who is infatuated by Tanya. His individual dance routine and acrobatics are very clever indeed. I also loved the stag party beach scene when all the lads dance in flipper while wearing goggles and snorkels. One of my Abba favourites is 'Our Last Summer' which is performed by Harry (James Hogarth) and Donna while another, 'When All Is Said And Done' (the solo Pierce Brosnan sings in the film), is missing as is the anthemic 'Waterloo'. However while 'Waterloo' doesn't actually featured in the storyline, once the curtain rises on the show's colourful glitzy, glamourous, boots and lycra finale, the whole audience is up on its feet, clapping, stamping and dancing to 'Dancing Queen' before finishing off with the song that made Abba a household name back in the day! In the pit are six tremendous band members under the direction of the keyboard-playing Richard Weeden while the whole cast and production is of the very highest quality. It really is a cracking show so 'Why Not Take A Chance On Me' and get yourself a ticket for Mamma Mia! by calling the Box Office on 0844 871 7652 (7p per minute and booking fees apply) or online at www.atgtickets.com/miltonkeynes.